“Ooooh, kimchi lasagna!” exclaimed Dr HH, who has basically never encountered a (meat-free) food he wouldn’t try. So, off we went. It looks innocent enough, but there is indeed kimchi in there. I was brave enough to nibble a tiny bit, and it was too weird for me. I’m not keen on either pickled or spicy food, so as far as I was concerned this was sullying a perfectly good lasagna, but Dr HH really enjoyed it. As well as enjoying the heat from the spices, he also thought the kimchi helped improve the texture with a bit of bite. He concluded that he wouldn’t go out of his way to recreate this or find it again, but it was certainly an interesting experience. 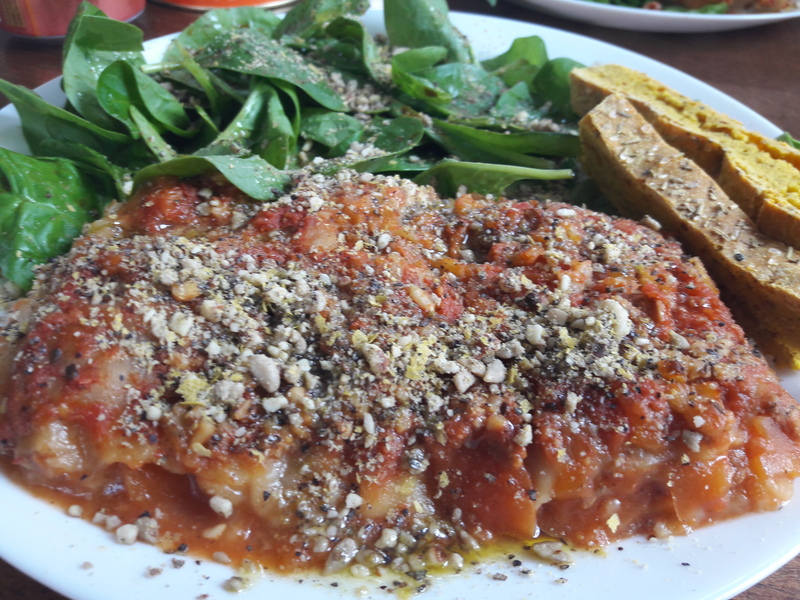 By comparison, the straight up bolognese lasagna was flavoursome, especially the parmesan on top, but also quite soft and sloppy, lacking a bit of bite. It was a solid option though. 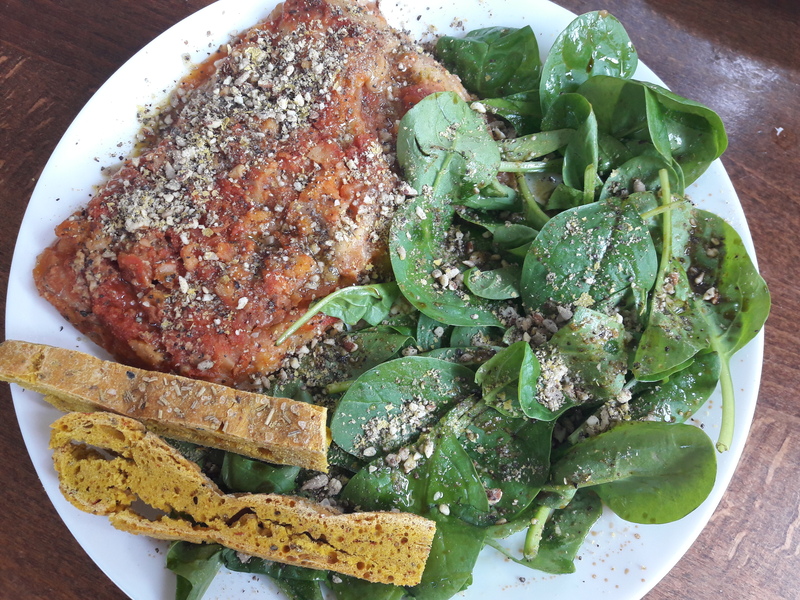 I really liked the nicely dressed spinach leaves and the homemade bread on the side, too. 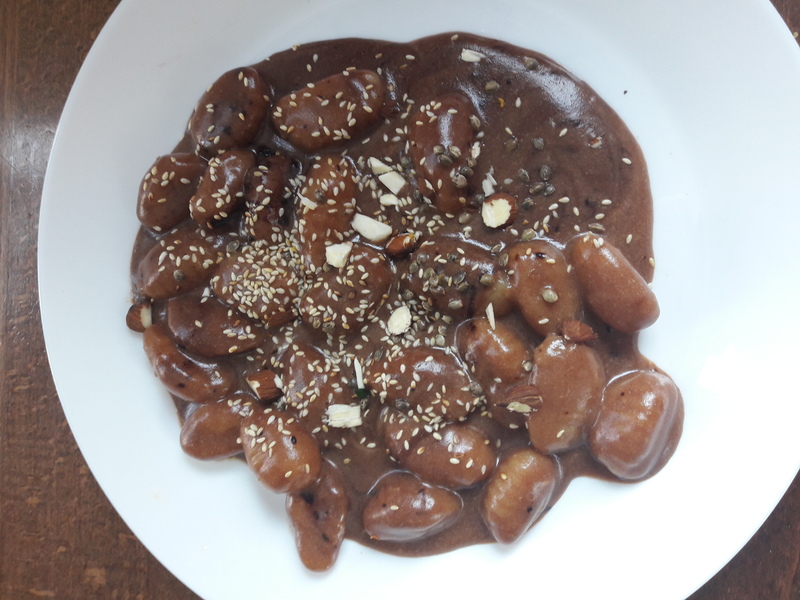 Dr HH also went for the fusion dessert: gnocchi with chocolate and gochujang sauce – it was a tasty, sticky sauce, with a nice extra crunch from seeds on top. To me it looks like an insane portion size, but he tucked it all away with ease. And I played it safe (again) with a non-fusion dish – and I don’t regret a thing! 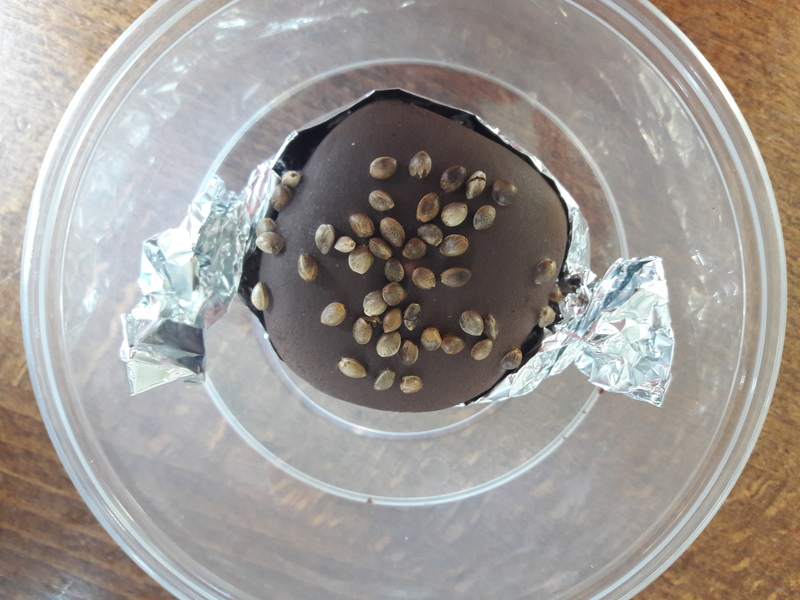 This mochi just delicious – like a marshmallow covered in chocolate! I was tempted to get some more to take away, but as I was trying to minimise my plastic use I resisted. Takeaway seems to be the done thing – it’s a small place with limited seating options, but they were doing a roaring takeaway trade. While we were in they were offering free slices of bread to everyone waiting, and the Italians who were running it were very friendly and welcoming indeed. It seems like a place worth supporting, and if you’re feeling brave, give the fusion dishes a whirl! 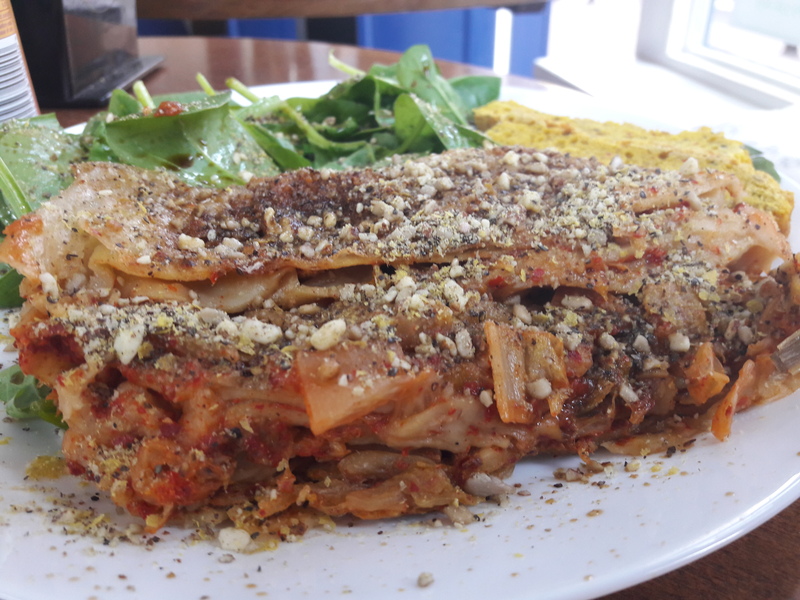 Would you try kimchi lasagna? What’s the boldest fusion dish you’ve had? 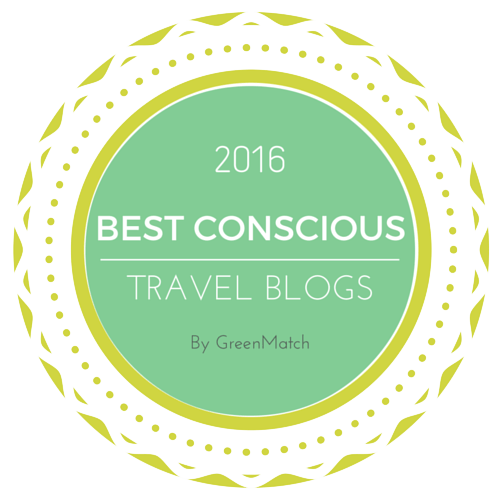 This entry was posted in Travel, Vegan Mofo and tagged kimchi lasagna, vegan London, vegan travel, Vegan Yes London, veganmofo18. Bookmark the permalink. I love their mochi! When we were in Amsterdam we went to a Caribbean Japanese vegan fusion place – that was something else! Was that called Terrazen? We loved the food there, but the service was possibly the worst we’ve ever had! Italian and Korean?! Sounds crazy but I guess not? It kind-of makes me think of a Korean show named Pasta, which is all about a high end Italian restaurant. I stopped watching it because the main love interest was just WAY too misogynistic to picture any girl to fall in love with him. BUUUUUUT back to food. I remember seeing a Chile-Chinese fusion restaurant awhile ago thinking that was crazy, but it turns out that it is based on a cuisine style created by Chinese immigrants in Chile. I made a Korean-Mid-western dish on my blog- kimchi tater tot casserole. Ah, I think I remember reading your recipe for that! Chile-Chinese fusion sounds interesting, especially as I know nothing about Chilean food anyway!